This article submitted by Michael Jacobson on 4/14/99. Nearly seven years after its formation, there is renewed interest in joining the Paynesville Area Hospital District. Legislation that would enable the city of Richmond to join the Paynesville Area Hospital District could pass the Senate this week and then would just need the governor's signature to become law. According to Senator Michelle Fischbach's office, the Senate bill--which is identical to one that passed the House 129-0 on March 18--has passed committee and is among the general orders on the Senate floor. Considered not to be controversial, these bills usually require no floor debate. The city of Richmond would be the first new entry into the district since 1995, when the city of Eden Valley also used special legislation to join the district. Eden Valley is the only addition to the original district. The other seven cities and townships joined when the district formed in 1992. Those entities are the cities of Paynesville, Regal, and St. Martin and the townships of Paynesville, Roseville, Union Grove, and Zion. In addition to the expected entry of Richmond, interest has also been renewed in the city of Lake Henry and Lake Henry township, and in the city of Roscoe and Eden Lake Township. The hospital district has been approached by both Roscoe and Eden Lake Township to present information about the district. Representatives are scheduled to attend the Roscoe City Council meeting on May 12 at 7:30 p.m.
Board chairman Don Thomes said he did not know exactly what had renewed interest in the district. "I can only speculate that they've been watching the district and some of their fears have been reduced," he said. Another factor is the changing composition of local boards. Especially on three-member township boards, one new member can tilt the board's position. The original goal of the district was to broaden the base of support from just the city of Paynesville--which had owned the hospital, the Koronis Manor, and 700 Stearns Place--to a larger area. Fifteen cities and townships were identified for possible membership in 1992, but only seven joined at that time, and later an eighth, Eden Valley. Actually, the local boards of the city of Eden Valley, the city of Lake Henry, and Lake Henry Township all voted to join the district in 1992. The city of Eden Valley couldn't join at that time because voters in Eden Lake Township opted decisively not to join the district in a September 1992 referendum. Because it does not border the district, the city of Eden Valley had to get special legislation in 1995 to join. In a referendum in Lake Henry Township in May 1992, voters rejected joining 73-31. That prevented the city of Lake Henry from joining because it was not contiguous with rest of the district. Recently, the issue was raised again in Lake Henry. Hospital district representatives attended a meeting in Lake Henry Township before the township elections in March. The township tried to put the issue on its March ballot but ran out of time. According to the township clerk, Ralph Klassen, Lake Henry Township will try to decide separating the township and the city of Lake Henry before they consider joining the hospital district again. Voters in the city of Lake Henry are still considered township residents as well, and can vote in township elections, too. Klassen said a vote to decide if the city is separate from the township would probably take place next March during the township elections. A referendum on joining the hospital district could take place any time after that, according to Klassen. The city of Richmond is separated from the district by Munson Township, which rejected joining the district in a referendum vote in March 1992. That vote was 44 for joining and 154 against. The city of Richmond set up an advisory committee to research joining the hospital district. City council member Dave Rausch served on that advisory committee and recommended joining. "I was always in favor of it," said Rausch, "and I think it will be good for the city." The city council voted unanimously in favor of joining the district on Dec. 30, 1997. After a petition requested a referendum, the issue went before the voters of the city on Nov. 3, 1998, and passed by a narrow margin, 309 for joining and 307 against with 12 blank ballots. In an interview at the request of the Press, Richmond mayor Pat Evens said he offered a verbal amendment to the Senate bill saying that Richmond should join the district when the district would be contiguous. Evens said a contiguous district would be beneficial to the city of Richmond, to the taxpayers, and to the district by simultaneously enlarging the tax base and reducing individual tax liability. The easiest way for Richmond to border the district would be if Munson Township joined. Evens said the city was rushed into joining the district. He wondered why entry couldn't have waited a year and why protections limiting tax liability couldn't have been erected. "Why not go slow and add some amendments to protect the city of Richmond?" he asked. After the amendment proposal, Senator Fischbach and Representative Doug Stang, who sponsored the legislation in the Senate and House respectively, sent a letter to the city asking the city to notify them if they changed their minds about the legislation. The original House bill is preceeding in the Senate. Rausch said he studied the financial statements for the hospital system during their evaluation process. "I'm not worried about taxation," he said. "My main concern is taxing," said Evens. He felt the city of Richmond was already contributing its share to a new clinic through Tax Increment Financing. He is worried that the orientation of commuters in Richmond is towards St. Cloud and that if the clinic should ever falter taxpayers would then be liable. Taxation continues to be a main point of opposition in townships, too. Klassen said his family uses the health care facility in Paynesville but opposes property taxes. Like school districts, taxation for the district would be done through a levy on property. Klassen said that type of financing is unfair to agriculture. "The point is if we have to tax," he explained. Thomes said they heard that complaint at the public meeting in Lake Henry township. "They feel it's not right that they should pay tax on bare ground," he explained. "In my opinion, I can't argue with them." The district does not determine the method of taxation. That is done by the state Legislature. Thomes said he believes the benefits of the hospital district outweigh the potential for taxation, but said people had to choose for themselves. "I'd sure like to see them all join the district and get their voice in the hospital," Thomes said. 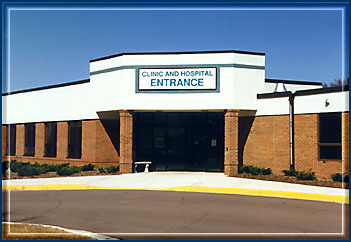 According to hospital system administrator, Willie LaCroix, the hospital has not taxed in its 44 year existence. The health care system is running in the black again this year, but there will always be the potential to tax. "There is risk," said LaCroix, "no doubt about it." Just the potential tax base, though, gets the district better rates on bonds when financing projects. Lenders like the single focus of the district plus the security of repayment, said LaCroix. LaCroix attributed the renewed interest to the financial success of the district and its growth. Since forming in 1992, the district has not taxed and has purchased clinics in Belgrade, Eden Valley, Paynesville, and Richmond. It also has formed a partnership with a group of local doctors and recruited new doctors to join the group. "Whenever you expand the district, you have more people involved and more ownership," said LaCroix. Through representation on the hospital district board, people get a voice in health care services, he said. In return, LaCroix hopes the health care system's patient base will expand. "Certainly we're interested in anyone wanting to join us," said LaCroix.